Calling All Millennials: Do I Have You Pegged? I frequently get called on to talk to clients and help them understand this “elusive” generation of teens and young adults we call “Millennials” or “Gen Y”. This generation is in an interesting stage of evolution: some are in still in high school while the oldest are approaching their mid thirties and general this group of “young folks” spans several life stages. In some recent work I have done some “distilling” of high level insights about Millennials based on years of observation, structured study and general empirical data collection. What I want to know from the “so-called Millennials” (totally stolen from one of my new favorite blogs) is how well these insights really capture your reality? 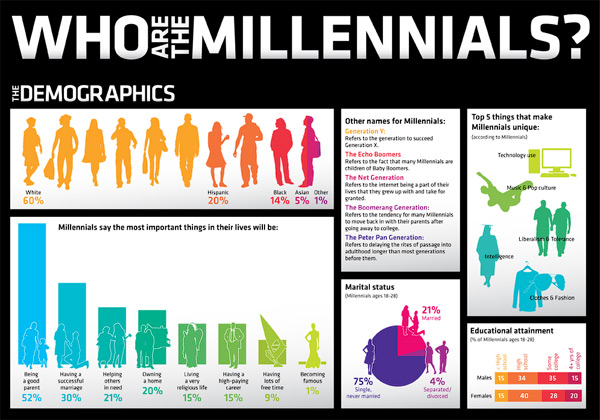 While I understand that every individual has different circumstances and not everyone can relate, I would love to get some thoughts from “actual” Millennials (even though I am not too far removed age-wise) on how they are being represented in the social science / marketing space. Millennials have come of age in a world in flux (terrorism, war, collapse of financial institutions, etc), which has affected both their economic outlook as well as lifestyle priorities. They are carreer focused but mindful of the need to be self-sufficient and entrepreneurial. They want to live a balanced life whereby their career feeds passions and matches their ideals in addition to providing income. This is just a “taste” of some of the high level ideas and ideals I talk about with clients and other folks in the industry I work in. It is absolutely not all encompassing but I hope the point of view is at least somewhat on point. So, hit me with your best shot, Millennials!